For Visit 17, the main design phase of the project continues. MinD colleagues met at Eurecat, Universitat Politecnica de Catalunya and Pich Architects offices in Barcelona. The design team worked on the development of design proposals in response to the three (originally four) remaining ‘transition areas’: Coming to terms with emotions; Maintaining social participation; Negotiation and communication. For each transition area different potential design solutions to increase wellbeing and social interaction of people with dementia were generated. In the first week, the team focused on idea generation for each of the transition areas, resulting in 7-10 ideas per area. Based on a list of criteria assessing the relevance, significance and feasibility of the design ideas, 3 of the ideas for each area were selected to be developed into more detailed concepts over the second week. Presentation slides for these 9 ideas were generated, for the round table discussion to be held in the second week. In the second week, these nine concepts were determined as You&Me – Me&You (shared decision making), Over to you (ceremony to handover responsibility), Dry Run (preparing for coming events), Just in Case (Break free from overwhelming situations), Tell it like it is (acknowledging your condition in social context), Now you are talking (conversation support), Social Engagement Map (interactive overview of social network), What I can do (service for sharing expertise), and Savouring (capturing good moments to re-enjoy). 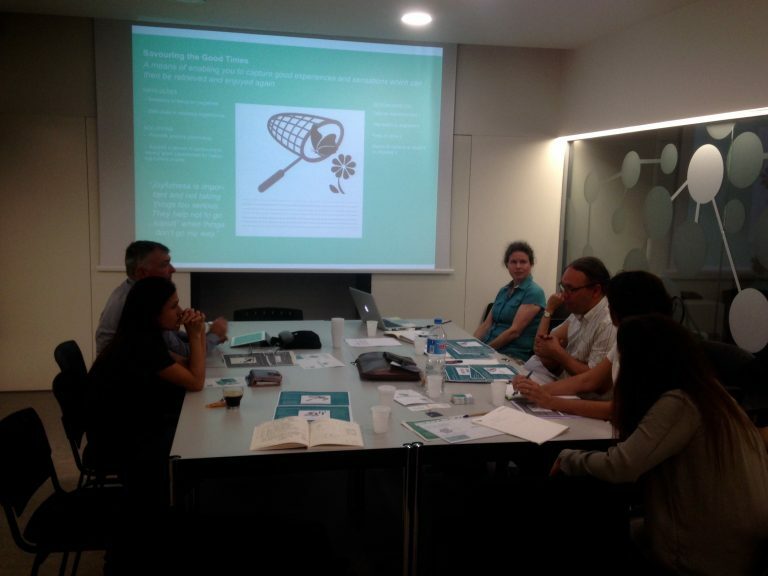 These concepts were presented to a round table discussion with mental health experts specialising in dementia from Sant Joan de Déu Hospital and Alzheimer Catalunya, organised by the Cluster Salut Mental Catalunya. The expert review provided valuable insights and supported our analysis and development of the concepts. The insights gathered from the expert review will also importantly inform the decision making process about which ideas to develop into prototypes, which is the next step in the project.